For a PDF file of the entire document, please see the Truman Library. The War Relocation Authority, or the WRA, was a civilian agency created by the US government in response to President Roosevelt’s 1942 decree that created military zones and control over the people in them. Foremost among the effected populations were Japanese Americans along the West Coast. Among the 90,000 evacuees that were relocated during the WRA’s second quarter between June and September, many families consisted of both Issei (first generation Japanese Americans) and Nisei (second generation Japanese Americans). In its Second Quarterly Report, the WRA noted that previously, the US government had made the mistake of failing to distinguish between Issei and Nisei: “While these groups are racially alike, and are closely bound in family ties,” the Report reads, “their background and conditioning are as far apart as those found in any other immigrant group”. This difference between generations was described by the WRA as a “schism”; by labeling this “serious” divide to the response of each group to the war, the organization was able to justify military actions in incarcerating over a hundred thousand people during WWII and continue labeling Japanese Americans as “aliens”. In general, the WRA notes and even contributes to this growing divergence between generational attitudes in three areas: its characterization of Issei loyalty, Issei fear of loss of familial power, and shifts of social power in the camp mess halls from Issei to Nisei, as enhanced by palate considerations. It is possible that with the resulting generational divide, WRA authority figures believed they would have more influence and control over Nisei, who generally had fewer ties to Japan. By including such a quotation in its report, the WRA provided its audience (presumably other authority figures in the organization) with evidence that despite the fact that Issei may not have harbored outright anti-democratic feelings, they did exhibit “defiance” that could warrant their relocation into incarceration camps. In an even more direct manner, the WRA also used confusing wording in its 1943 Loyalty Questionnaire that emphasized the generational divide. Question 27 was of utmost concern to Nisei, who worried that answering assenting to serve “whenever ordered” would equate to volunteering for the military (despite the fact that a draft was in effect so many would not normally volunteer). Many Issei, by contrast, were more troubled by the idea that agreeing to Question 28 and “forswear[ing] any form of allegiance to the Japanese Emperor” could mean becoming stateless as a result of renouncing their Japanese citizenship in the event that Japanese Americans would one day no longer be accepted in the United States. Thus, through the act of relocation as well as continued investigation of the Japanese Americans in the camps, the WRA emphasized and enhanced existing divergent sentiments between the first and second generations. The WRA’s Second Quarterly Report includes an entire section entitled “Feelings of Fear and Insecurity” detailing the evacuated population’s sentiments about their future. Issei parents are noted to be “profoundly disturbed by the lessening of parental authority over the children”, while their sons and daughters display a “marked tendency toward rowdiness”. These sentiments obviously contributed to a general feeling of unrest within the camps. 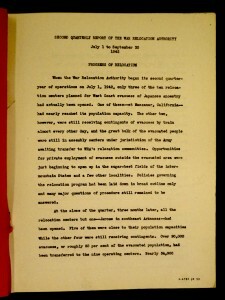 This dissension, however, was dismissed as merely a temporary change arising from “the very newness of the relocation program and from the fact that evacuees had been plunged into a situation unlike anything they had ever experienced before.” The writer of this report does not suggest potential improvements that could be made to the camps in order to minimize intergenerational conflict, and it is interesting to note that this dismissive observation actually foreshadows the shift in power from Nisei to Issei, as was also evident in the mess halls. For the incarcerated Japanese Americans, mess halls provided Nisei with the opportunity to socialize with people their own age. As a consequence, parents lost what was perhaps their primary opportunity to instill traditional values in their children, thus widening the gap between the attitudes of the Issei and Nisei in the aforementioned power shift. Since the dinner table had traditionally been a place where parents could discipline children, these new spaces and the loss of significant time spent with family resulted in a shift of power from the emasculated Issei fathers to the new Nisei community leaders. Attitudes towards the war became increasingly different, as many Issei remained ambivalent while Nisei, eager to prove themselves, showed patriotism for the United States. 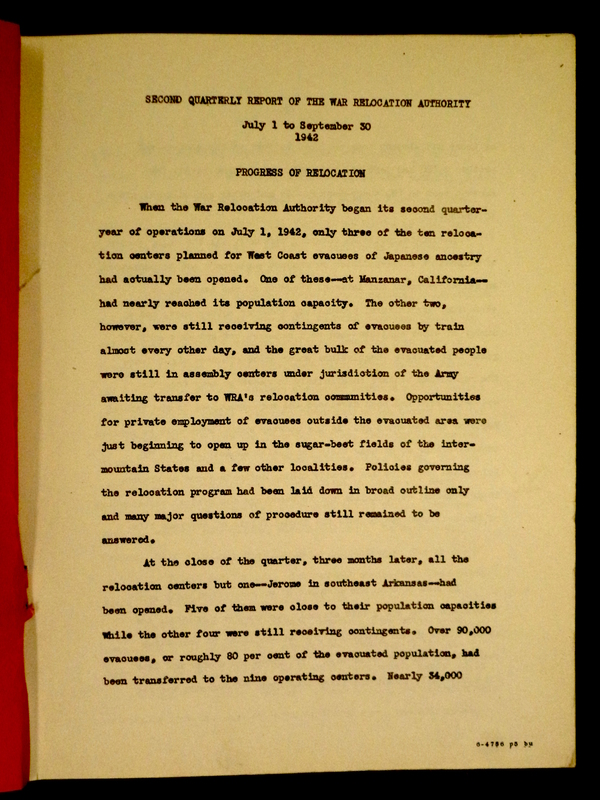 This effect was further enhanced by the food provided by WRA officials; in the Second Quarterly Report mention is made to the difference in appetite of each generation: “An attempt was made to satisfy both the Americanized tastes of the second-generation evacuees and the predominantly Oriental appetites of their alien elders.” Rather than treating the Japanese Americans as a homogenous population, the WRA noted and in this manner literally catered to the growing generational gap. The Second Quarterly Report of the WRA, probably intended primarily for other officials working for the same organization, clearly demonstrates the defining characteristics of the Issei and Nisei. This “schism” arose with respect to characterization of Issei loyalty, Issei fear of loss of familial power, and shifts of social power in the camp mess halls from Issei to Nisei. In general, this document serves to highlight the manner in which WRA officials acknowledged and even, at times, enhanced the rift that was growing between generations but treated it as an inevitable consequence of “new experiences” that resulted from being in an incarceration camp. Uprooted Americans: The Japanese Americans and the War Relocation Authority during World War II by Dillon S. Myer; The Great Betrayal: The Evacuation of the Japanese Americans during World War II by Audrie Girdner; Anne Loftis. Review by: Hilary Conroy. The American Historical Review, Vol. 77, No. 1 (Feb., 1972), pp. 229-230. 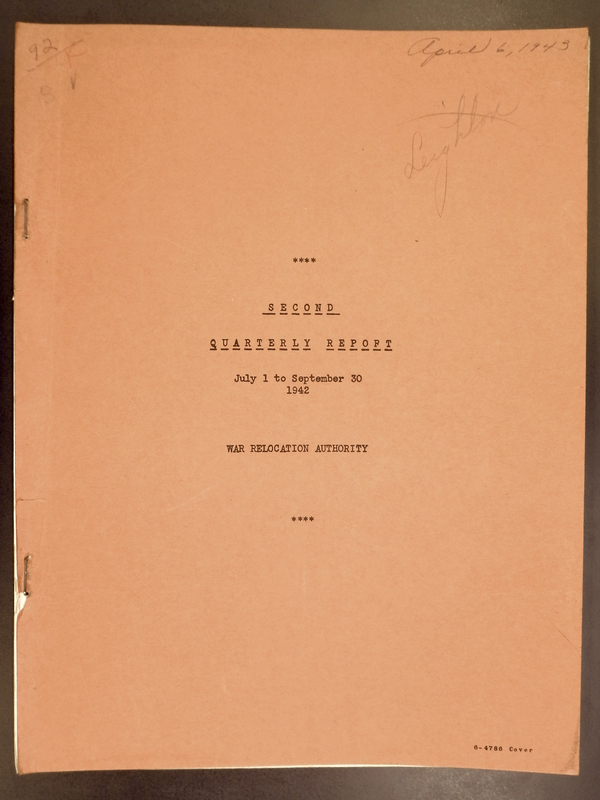 “Second Quarterly Report of The War Relocation Authority, July 1- September 30, 1942”, Japanese-American Relocation Center Records, #3830. Division of Rare and Manuscript Collections, Cornell University Library. p. 1. “Second Quarterly Report”. p. 55. “Second Quarterly Report”. p. 57. Hastings, E. (2011). “No longer a silent victim of history:” Repurposing the Documents of Japanese American Internment. 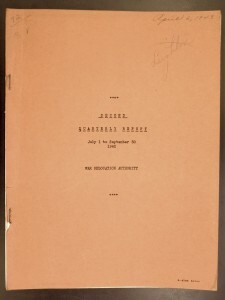 Archival Science, 11(1-2), 25-46. doi:http://dx.doi.org/10.1007/s10502-010-9113-2. “Second Quarterly Report”. p. 59. “Second Quarterly Report”. p. 62. Chrissy Lau, “WWII’s impact on Japanese Americans in the US” (speech, Ithaca, NY, October 21, 2014). “Second Quarterly Report”. p. 35.